Wonderful day walking from Louth to Welton le Wold, stopping at South Elkington along the way. Our Journey of Faith got off to a wonderful start due to the warm welcome and generous hospitality received at Louth, St James. We were given a fascinating tour by the Rev’d Nick Brown and his team. After considering the rich history of this holy place, we paused for prayer and set off on our Pilgrimage. Following the Pilgrim Guide Book , we walked through the beautiful Wold countryside to South Elkington , All Saints and onwards to Welton le Wold, St Martin’s. We were met with coffee and smiles by Peter Taylor and Alistair Kerr and enjoyed a bring and share picnic lunch. We all gathered at Welton le Wold, St Martin’s at 10am eager and ready to resume our Journeys of Faith pilgrimage. Our group consisted of a classic Bentley car, three motorbikes (two Harley Davidsons and a Honda) and, of course, their passengers, riders and drivers. The first port of call was Ludford, St Mary and St Peter where we congregated in the church yard to discuss the questions raised in the “to ponder” section of our guidebooks. We then moved on to Tealby, All Saints where we were the recipients of some lovely chocolate cake and tea before exploring this beautifully situated church. We appreciated Rector Chris’s and the Churchwarden’s kind hospitality. Our next place of pilgrimage was Market Rasen, St. Thomas and, once again we had reason to be grateful to the Churchwarden who was there to greet us and tell us about the history of the church. Lunch was enjoyed at the Aston Arms and here we were joined by a shiny red MG Midget, its driver and passenger. Legsby, St Thomas the Apostle, staffed by another friendly and knowledgable Churchwarden was our next destination. Our final lap saw us arrive at Hainton, St. Mary where the Churchwarden proudly showed us the marvelous and impressive Heneage tombs. A wonderful day ended at 4.20pm as we all returned home feeling truly blessed. Had a great time cycling to St Giles Church today, stopping at St Mary Hainton, St Martin South Willingham and St Mary East Barkwith on the way to St Giles Langton by Wragby. Despite these seeming setbacks, our pilgrims pressed on to be warmly welcomed by local churchwardens at each of the destinations. Our guidebooks were a constant companion as we read about the history of the churches, written by our Journeys of Faith historian, Judi Jones. There was also time for some spiritual reflection prompted by sections of the guidebook written by the Revd Dr Sally Myers, our Journeys of Faith theologian. We were also delighted to be joined by Alison and Porsche of Lincoln BIG on our pilgrimage cycling day. Also thanks to Tony Wilson for providing a back up vehicle and making sure refreshments were available at our stopping points. Join us tomorrow as we walk from All Saints Church in Wragby and then travel by minibus to St Clement’s in Fiskerton. Our pilgrims, accompanied by Rupert the dog, made it safely from All Saints Wragby to St Clement of Rome at Fiskerton, stopping at St Andrew’s, one of the smallest churches in Lincolnshire, along the way. The day began with a bus journey to Wragby where we were met by the Revd Mark Holden, who welcomed us to All Saints church. After exploring the church with him we read the accompanying text in our Journeys of Faith guidebooks, concluding with a reading from Philippians 3. We then commenced our walk, referring to the map and walking instructions written in the guidebook by our Journeys of Faith walk designer, John Harker. It wasn’t long before we met a rambler, heading in the opposite direction, who stopped for a chat. He was soon convinced by John that a 50 mile pilgrimage would be a great idea! The next unscheduled stop occurred when we met 2 friendly local farmers who had seen some media coverage of our previous day’s bike ride. John didn’t sell the idea of pilgrimage to them but they were very interested in our progress! Arriving at Apley, we were warmly welcomed by the Church Treasurer and managed to attract another passing rambler into joining us as a pilgrim! Waiting for us with the Cathedral Choir minibus was Alex, one of the Cathedral’s Lay Vicars and choristers. We talked him into singing a requiem piece in St Andrews Church. It was sung beautifully and we all found it very moving. Our next stop by minibus was at St Clement of Rome in Fiskerton where we were warmly welcomed by the Churchwarden who pointed out some very interesting historical features of the church. We again congregated to read the extract from the guidebook, covering the story of St. Clement, who was martyred in an unusual way. We then walked a short distance for a pub lunch, which ended another inspirational day of pilgrimage. Today is the final day of this week’s Journeys of Faith. The pilgrims are travelling from Fiskerton to Lincoln by narrowboat arriving at 3.30pm at Brayford ready to make their way to their final “Journeys” destination – Lincoln Cathedral. Today We visited Fiskerton Fen, where our pilgrims enjoyed a bring and share picnic before surveying the wildlife across the main lake from a bird hide built in the style of a Bronze Age hut. Pilgrimage is a journey but it doesn’t have to be on foot. For those with less time, other means of travel are perfectly acceptable. 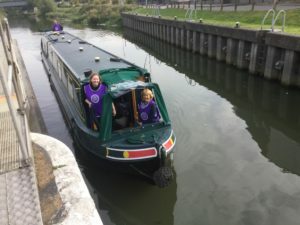 The journey is the main event, however it is made, and today we travelled from Fiskerton to the Brayford by narrowboat. We were very grateful to Derek and Barbara Wellman for taking us along the River Witham in their narrowboat, the Melita. 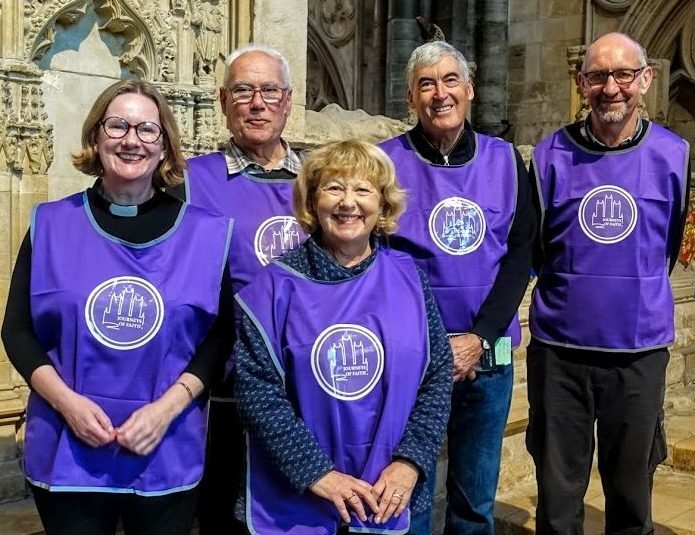 Arriving in Lincoln we were joined by other pilgrims as we walked up Steep Hill to St Mary Magdalene’s church, where we were warmly welcomed by the Revd Adrian Smith. A hundred yards later and we arrived at our final destination, Lincoln Cathedral, where we were greeted by the Dean of Lincoln and the Chancellor, who said a concluding prayer for us at St Hugh’s Shrine. We then received an embossed silver pilgrimage stamp in our guidebooks, to record the completion of our Journey. Five wonderful days were over all too quickly, leaving a medley of marvellous memories. We have always appreciated the beautiful countryside in which we live but our journey from Louth to Lincoln Cathedral was something special. The visits to the churches were fascinating, and we were given a warm welcome wherever we went. Perhaps it was the weather, or the excellent company, or the wonderful scenery – or all of this, but this was an experience not to be missed. 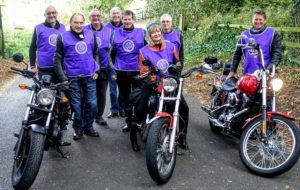 Why not get your boots on, your bikes out or take any form of transport to enjoy your own Journey of Faith? You won’t be disappointed! If you weren’t able to join us on our journey, you can always pick up the Louth guidebook from the Cathedral or order one online here. Journeys of Faith Project Team Left to Right: The Revd Dr Sally Myers (Theologian), Michael Newstead (Photographer), Judi Jones (Historian), John Harker (Route Designer), Alan Wilson (Team Leader).